If your facility has pallet racking systems and mechanical handling equipment in use, the risk of damage to one or more components of the pallet raking system is very high. Pallet rack systems are designed for high performance and to support product loads many times their weight. The systems are built to standards that ensure they perform within designed load applications corresponding to the configuration for many years. However, the design specifications and safety factors issued by the pallet racking manufacturer typically do not take into account the loss of capacity and integrity once the pallet racking system has been damaged. Nothing affects the integrity of a pallet rack system like a forklift impact. Operators are not likely to report a collision involving pallet racking structures, so the damage can go undetected. This emphasizes the importance that pallet rack systems be routinely inspected and maintained to manufacturer and standard specifications to maintain original designed capacity. OSHA Construction standard 1926.250(a)(1): All materials in tiers shall be stacked, racked, blocked or otherwise secured to prevent sliding, falling or collapse. OSHA General Industry standard 1910.176(b): Materials shall not create a hazard. OSHA General Duty Clause Section 5(a)(1): Employers are required to provide their employees with a place of employment that is free from recognizable hazards that are causing or likely to cause death or serious harm to employees. The employer should establish and implement a program of regularly scheduled storage rack system inspections. The inspections should be performed by a qualified person familiar with the storage rack design and installation requirements retained or employed by the storage rack system owner. OSHA defines a qualified person in 29 CFR 1910.21(b): a person who, by possession of a recognized degree, certificate, or professional standing, or who by extensive knowledge, training, and experience has successfully demonstrated the ability to solve or resolve problems relating to the subject matter, the work, or the project. Storage racks should be inspected periodically to check for any damage or abuse and immediately after any event that occurs that may result in damage to the rack. The frequency of inspections is up to the discretion of the owner and dependent on the conditions of use. At a minimum, inspections should be performed annually. The inspection schedule and results of the inspection should be documented and retained. Even if you hire a professional inspector, it is suggested to designate and train someone within the company who will make periodic self-checks of the pallet raking systems. The Rack Manufacturers Institute (RMI) has many resources for inspectors and training curriculum. 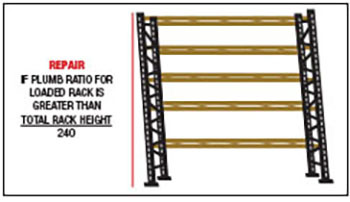 According to ANSI MH16.1-2012, the maximum top to bottom out of plumb ratio for a loaded rack is Total Rack Height/240 inches (see image 1). For example, a 15 foot (180 inches) column upright height maximum plumb ratio would be 180/240 or ¾ of a foot. This is measured from the centerline of the column upright at the floor to the centerline of the column upright at the top of the shelf elevation. Any rust or corrosion can indicate weakening metal. If paint is scraped, a rack may have suffered a collision and should be checked for plumbness and straightness of the upright columns. Damage to specific components of a pallet racking system is the most common and serious problem that can affect the integrity of the racking system. 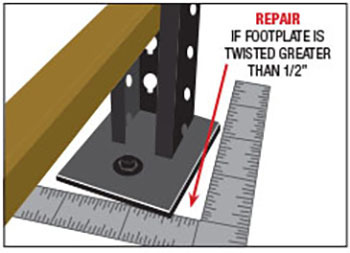 Most common components involved in damage are beams, upright columns and foot plate/anchors. Beams: Any beam with visible deformation or cracking of the beam end connectors should be unloaded and replaced. Be sure beams are fully engaged and installed with proper safety locks. Upright columns: Any rips, tears beyond the manufacturer limits need to be repaired or replaced. 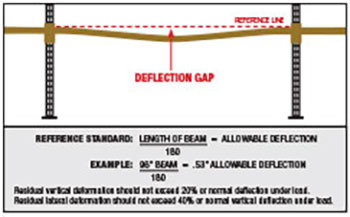 Any deflection gap greater than ½ inch (ANSI MH16.1-2012) in either the down aisle or front to back direction must be repaired or replaced. This also includes horizontal and diagonal struts. See image 3. Foot plate/anchors: Any front and back footplates which are torn, ripped or twisted past ½ inch square. See image 4 below. Each footplate of the upright (front and back) must be anchored to the floor. Check for missing, loose or sheered anchors. 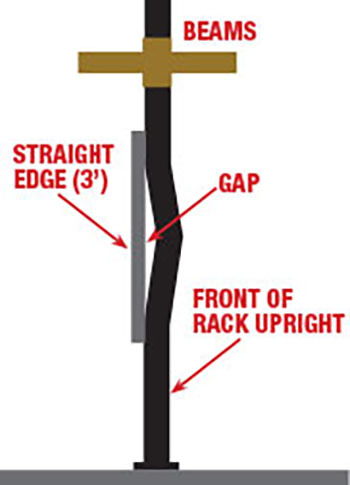 Note: A trick to measure for damage to upright columns is to place a steel straight edge (ruler or level) on the surface of the concave side of a damaged upright column segment. The straight edge should be centered on the damaged section’s length as accurately as possible. This will allow for a more accurate measure of the gap distance. Just doing inspections isn’t enough. All inspections and actions taken to correct issues should be documented. Documentation helps track the process in the event of any future issues. This applies to all contracted inspection services as well. Q. Do I need a building permit for my rack system? A. Rack structural systems, not unlike building structures, are often subject to the building code review and permitting process. The pertinent building code is usually required by an authority having jurisdiction (AHJ). Most building codes which have been adopted and are being enforced include rack structures, examples include the International Building Code (IBC) and the National Fire Protection Association (NFPA). These codes often include the requirement of a local building permit. Occasionally, local requirements may differ slightly from the more generally-applied national and international building codes. The user should always check with local authorities which building code is applied and followed. Q. Does OSHA require pallet racking to be anchored to the floor? A. There is no specific OSHA standard, however, they have referenced the General Duty Clause 5(a)(1) to cite employers for pallet racks and other types of industrial steel shelving that are not adequately secured from falling over.